Looking for a way on how to reduce stress? Learning is a ongoing process and it is important to use what is useful to each person individually. Here is a video on the benefits of the acupuncture point PC 6, known as pericardium 6 or nei guan. It is used to reduce stress and issues affecting the chest and abdomen. What are some of the other benefits of PC 6? 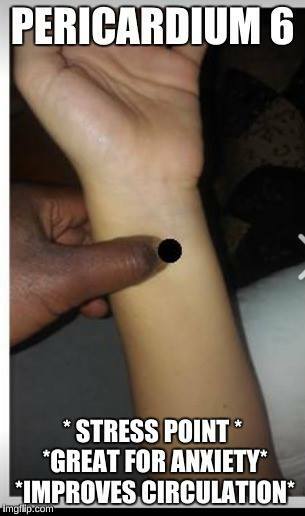 What are the tendons that surround the point? The palmaris longus and Flexor carpi radialis. They are tendons to two muscles that help to flex the wrist. How do I use this point? This is where you can go see someone who can help you identify and learn self acupressure techniques so that you learn the right way. You can see a local Acupuncturist to help learn more about points and the theory behind the points used. Have you used this point before? Yes I have. I use it clinically with patients and I have used it on myself. I have also spoken with a researcher from UCI center for integrative medicine studies on some of the research and benefits of this point. Are there other points besides PC 6? Like PC45? There are 9 points in total on the pericardium meridian according to Traditional Chinese Medicine. Other points are used as well, not only to reduce stress but for many other benefits. In future posts we will learn more about the major points in this meridian and the benefits that can help you become healthier. This is not intended to be a diagnosis or replace seeing your primary care medical provider.